We all need information about different things in our daily routine. For example you may need address of some good hotels, bars in your locality or you may want to make a reservation at SPA. If you ask me, what I was using to deal with all these queries, the answer is Google. Along with google, I used different apps for different tasks. But instead of using different apps, why not use one app for everything and that’s where ASKME app comes in picture. You may have heard about ASKME in recent advertisement starring Ranbir Kapoor. For those who don’t know, ASKME is termed as “The BAAP of all Apps” because it has all the features included in one single app. It has details of millions of businesses in our locality in which we can run a customized search to find answers to our queries. What is the use of AskMe App? AskMe app can be used to search for places to eat, shop, drink and relax. You can also search for merchants, listing, classified ads, and discounted deals. You get almost all the information you required to make your task easier. Along with searching information, you can directly place a call from the app itself. No more need to copy the number and then dial it using the dialer. Not only placing calls, you can also make reservations in hotels, spas and other places using ASKME app. 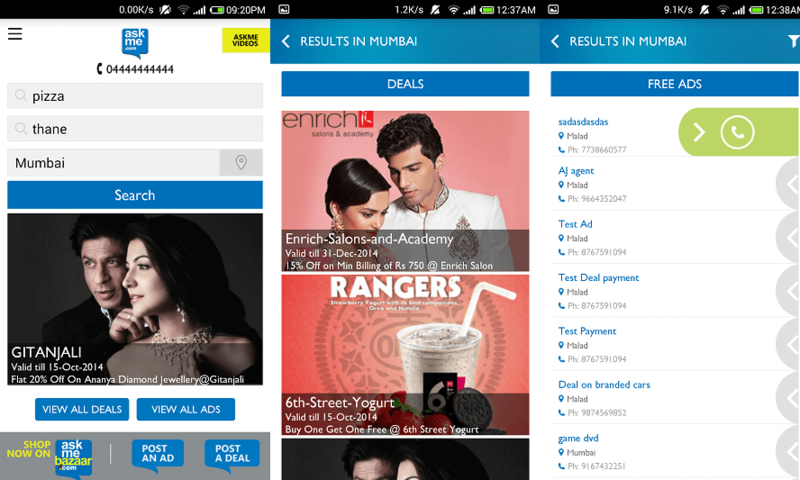 Other than searching, you can also place your own ads, and display your own deals in the app. You can also read and write reviews about a particular location or service that you used. And guess what, you have to pay nothing as the APP is totally free to use. In short, ASKME is the replacement for all the different apps and services that we use over the internet. It’s a one place to find all the solutions to our queries. How to Install ASKME app? Currently this app is only supported for android mobiles. Soon it will arrive on other platforms too. Android users can download the app from Playstore. It is a small app, and just requires internet connection to work. People not having android mobiles or internet connection can just dial 04444444444 (4 ten times) and enjoy the same service via call. Once you install the app, it will ask to access GPS and track your current location. This location will be used to show all the services and deals in your locality. You can always change the location using the options given in the app. There are simple two text fields to search for any service that you want. As per my experience ASKME is a really great app and has helped me a lot, more importantly saved my precious time. So I recommend all my readers to try it once and get all the benefits of this free service. Please let us know your experience with the ASKME APP in the comments section below.